Dog owners no longer have an excuse of falling foul of the law when it comes to picking up after their pets after the installation of free dog waste bag dispensers at a number of locations across borough of St Helens. 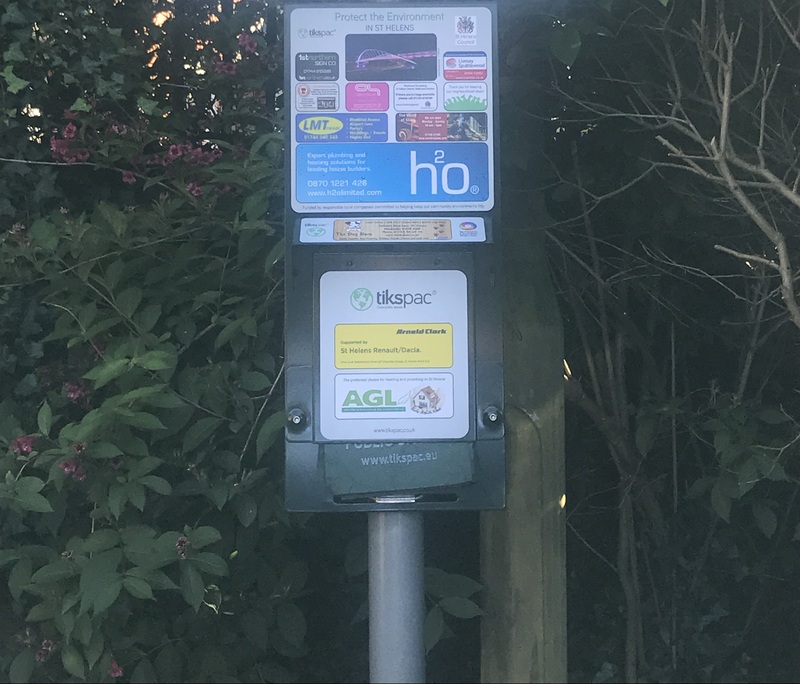 Ten TiksPac stations, which hold sufficient 100 percent compostable and biodegradable dog waste bags, are accessible 24/7 in various parks, cemeteries and visitor attractions for dog owners to use – rather than face an on the spot fine of £80 if found caught short of failing to clear up after their pet. The news should also get tails wagging among non-dog owners, too, who won’t have to foot the bill through council tax. Stations have been provided free of charge by international market-leading company, TiksPac, through station sponsorship opportunities as part of a unique deal to St Helens from the Swedish company, whose UK office is based in the Newton-le-Willows area of the borough. TiksPac – whose goal is to bring about the kind of involvement to help create a cleaner environment in a sustainable society – will also provide replacement dog bags and replace any damaged stations for free. The original ten stations have been installed at Taylor Park; St Helens Cemetery; Mesnes Park; Victoria Park; Sankey Valley Visitor’s Centre; Bankes Park; Newton Cemetery; Sherdley Park; Sankey Valley, Bradlegh Road – and Rainford Linear Park. It is planned to install more dog waste stations at various libraries across the borough. St Helens Council’s Cabinet Member for Green, Smart and Sustainable Borough, Councillor Terry Shields, said: “Dog fouling is against the law and yet all too often we hear things like ‘I’ve just used my last bag’ as someone’s excuse for not cleaning up after their dog. “Well now there can be no more excuses from irresponsible dog owners who fail to pick up after their pets, damaging our beautiful parks and open spaces which we work so hard to maintain for the public’s enjoyment.